First thing i encountered was this http://www.speedtest.net/result/4761444993.png not sure if it was serious. By the looks of it even at everyone elses low speeds trumps mine, and there seems to be no improvement in sight. Certainly not the speed we'd expect to see for ADSL2+. Did you run this test connected directly to the modem via ethernet cable? It might be best to give the techs a call on 131344 so they can take a look at the service, as something may be wrong with the setup. Ok in response to my earlier comment I called this morning at 8am, about a 10 minute wait for an answer (was told it would be 20). - he told my mobile number to SMS me when things were fixed. - I THINK he may have mentioned congestion, cant remember exactly. Told him that after 3 weeks of slow speeds, I would like some compensation seeing as the service I am paying for is unacceptable most of the time I want to use it. He asked if I was paying for the speed pack, which im not sure I explictly am (my plan is an older 120GB plan, the speed pack was included for 'free'). He ended giving me a $20 credit for this month. Had to ask for it though. I little vague but at least I got something. Sounds pretty much the same response as others have got. Will be calling back on September 1st if things have not improved (not holding my breath!). Im still receivign the same slow speeds in the evening. Clearly a congestion issue around Ferntree Gully. It's just not good enough. I expect better than this considering they get my hard earned money when the bill is due. Can someone from Optus please contact me to discuss this. I'm not calling through technical support to have someone tell me theres nothing wrong like everyone else. Am I getting charged next month on my not so "Supersonic Speed" pack? I must be on Optus "Super Slow Speed" pack! I just got a message from Optus, ahh no false alarm they just want to give me a Samsung. I don't want a free Samsung I just want my 100mb back please. I have been with Optus for 18 years ever since they rolled Cable out. My mother worked for Visionstream that designed the network, it was made to be upgraded at the local exchanges and hubs. I was told the week before last that they where waiting for equipment and last week they where installing it. But a lack of communication by the company may cost them dearly in the end, they have got all of our contact or mobile phones numbers but no call or photo's of such equipment going in, no brief diagram of the type of technical work being undertaken (maybe it is a commercial secret) because if it got out a rival may setup a network like 8 months ago. This is the type of management decision and cockup that I thought only Telstra was capable of doing, reminds me of the early ADSL days when Telstra management overrode the engineers plans for the setup of the DSLAM Nortel boxes that caused thousands of ADSL modems to deny Authentication. But Telstra did not give a %@$T it was still making Millions selling ISDN dual phone lines to businesses. So the real truth and motive is always hard to see. I must admit I already went through the abysmal speeds until the upgrade at Rochedale QLD was completed. a few weeks later and it's back to the same poor performance during peak times. Telstra looks like the only viable option as I don't get much free time to watch HD movies, and when I do they're flit from HD to sub SD with Optus. There were no offers of compensation, no investigation. And if I hear that I need to 'cycle the power' (jargon for turning stuff on and off) I'm going to scream; you're not dealing with a novice here!!!! How can you be "upgrading the infrastructure in your area" when you no longer own that infrastructure? NBN Conow owns all of the Optus HFC network, so what exactly is it that you're upgrading? Will you tell the ombudsman when they ask on my behalf? Because you certainly will not tell me when I ask directly. After all, I am only a customer!! Why don't you stop telling your customers lies, and admit that you have signed too many customers on to an already stretched infrastructure, and then Netflix arrived and tripled the bandwidth demand, and now there is no way you can possibly fix it, except that hope enough customers jump ship to get the network bandwidth back. You're lucky. I pay for the 100mb cable plan and speed (lack of) started back in June. I used to consistently 90mb download speeds. Each time I ring support they say the problem is congestion and that Optus are working increasing the network capacity. No one can tell me when. "Ring back after you get the next bill and I can apply a credit"
"We can only organis a credit after your problem is resolved"
"I can give you a one of credit of $30"
I'm in Forestville NSW, in the evenings I'm now down to about 2mb. 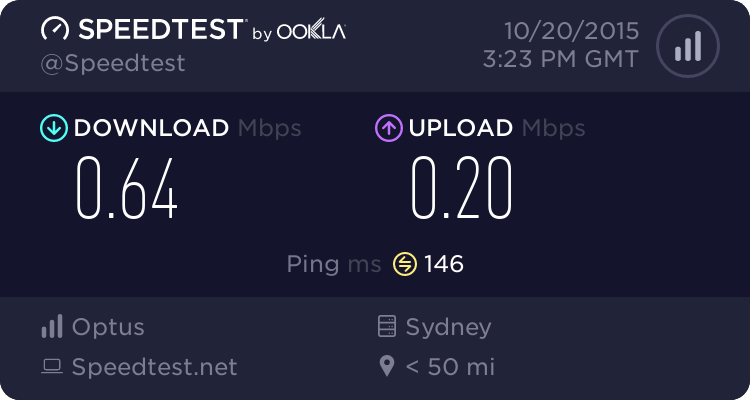 I've been with Optus cable for over 15 years and want to stay with them, but this is getting beyond a joke. Cable is great, but how long to I have to wait for a fix? A few minutes ago did Optus speed test. Line speed 231 kpbs download speed 29 KB/s. Not much better than dial up. Is this normal for Blackburn Vic area? I hope not. Also, link dropping out quite often recently. Weather? Old copper lines? From reading other posts, one gets the impression Optus got caught out by not keeping ahead with capacity expansion.